Posted by The Way to Akhirah , 03:13:00 Be the first to comment! ACCORDING TO THE QUR’AN WHEN A MAN ENTERS PARADISE, HE WILL GET HOOR, I.E. BEAUTIFUL MAIDENS. WHAT WILL A WOMAN HAVE WHEN SHE ENTERS PARADISE? "Moreover, We shall join them to companions With beautiful, big and lustrous eyes." "...And We shall join them to companions, with beautiful, big and lustrous eyes." "Companions restrained (as to their glances), in goodly pavilions." "And (there will be) companions with beautiful, big and lustrous eyes." Many translators of the Qur’an have translated the word hoor as ‘beautiful maidens’ especially in the Urdu translations. If hoor means ‘beautiful maidens’ or girls, then they are meant only for the men. 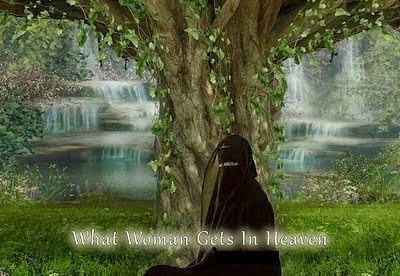 Hence, what will the women get if they enter Paradise? The word hoor is actually the plural of ahwar (applicable to man) and of haura (applicable to woman) and signifies a person having eyes characterized by hauar a special quality bestowed upon a good soul, male or female in paradise and it denotes the intense whiteness of the white part of the spiritual eye. The Qur’an describes in several other verses that in paradise you will have azwaj which mean a pair or spouse or companion which means you will have spouses or companions pure and holy (mutaharratun means pure, holy). "But give glad tidings to those who believe and work righteousness, that their portion is gardens, beneath which rivers flow. Every time they are fed with fruits therefrom, they say: "Why, this is what we were fed with before", for they are given things in similitude; and they have therein companions pure (and holy); and they abide therein (forever)". "But those who believe and do deeds of righteousness, We shall soon admit to Gardens, with rivers flowing beneath – their eternal home; therein shall they have companions pure and holy: we shall admit them to shades, cool and ever deepening". Therefore the word hoor has no specific gender. Mohammad Asad has translated the word hoor as spouse and Abdullah Yusuf Ali as companion. Therefore according to some scholars a man in paradise will have a hoor that is a beautiful maiden with beautiful big and lustrous eyes and a woman in paradise will get a man with beautiful big and lustrous eyes. Many scholars say that in context, the word hoor used in the Qur’an refers only to ladies since gents are addressed. A reply that would be accepted by all types of people would rather be the answer given in the Hadith when a similar question was posed that if a man gets a hoor, a beautiful Maiden in Paradise, then what will the women get? The reply was that the women will get that which the heart has not desired for, the ear hasn’t heard off and the eye hasn’t seen, indicating that even the women will get something exceptional in Paradise.